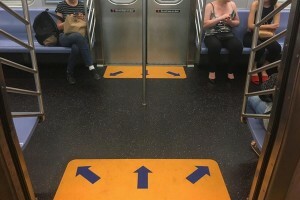 Directional Floor Mats The Answer to Reducing the MTA’s Delays? New York’s MTA Delays have become a major issue, so much so that Governor Andrew Cuomo was forced to declare a state of emergency in June. Now, a $20 million MTA plan is being implemented, which includes a simple yet effective solution… Directional floor mats. Passengers will no longer wander around aimlessly thanks to the arrows on the floor mats which point left, right, and straight ahead. More than 1.7 billion people utilize the train annually, so hopefully these new directional floor mats are up for the challenge.